Beadwork Magazine is dedicated to providing the best in beading projects, beading products and designer created beading projects. 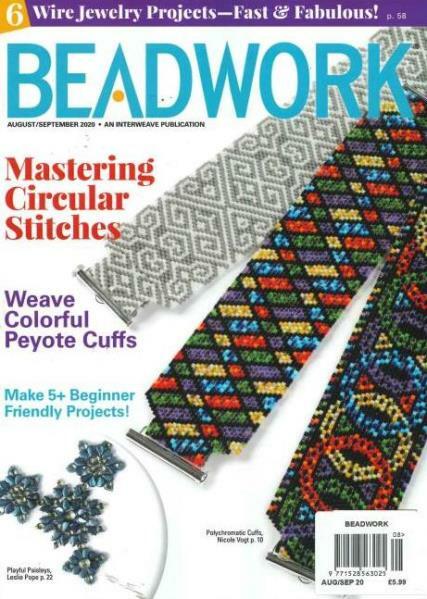 Buy a single copy or subscription to Beadwork magazine. It provides information on all major types of beadwork including wireworking, off loom beadweaving, beading embroidery, and on loom beadwork. The projects in Beadworker are aimed at all levels of beading experience from beginners to experienced beaders. The practice of beading for adornment, religious or symbolic reasons has been around since the beginning of humankind. All cultures on every continent have used a form of beading as an art form or adornment or in religious ceremonies. Both Native American and Oriental beadwork which became popular in the United States, in the 1800’s remains popular today. In the 1900’s the style of using very small beads from size 20/0 and even smaller. These small beads are no longer even made as they are too labor intensive to produce. In Beadworker Magazine you will find articles on beading techniques, interviews with beading professionals, discussions of beadwork on an international level, reviews of beading books, tools, supplies and lots of projects. This is my favourite magazine as the patterns and information keep my 85 year old brain very active. Some patterns are quite difficult but I just love the challenges posed by these and try to further develop them by experimenting with different beads , stitches and colour. I shall be registering for a further twelve months supply of this truly excellent magazine which far outstrips "Bead and Button."